After six years and thousands of slides, I can’t imagine getting along without Keynote. Its rival, Microsoft PowerPoint ( ) has made progress on many fronts, but still doesn’t equal Keynote’s. elegance or ease of use. Despite some disappointing oversights, Keynote ’09 is an evolutionary upgrade that raises the bar further. Keynote’s animation repertoire includes several welcome changes. A feature called Magic Move introduces a form of tweening, which automatically morphs one version of an object into another. For example, say you want to home in on a picture of the Earth to simulate the view from an approaching spaceship. 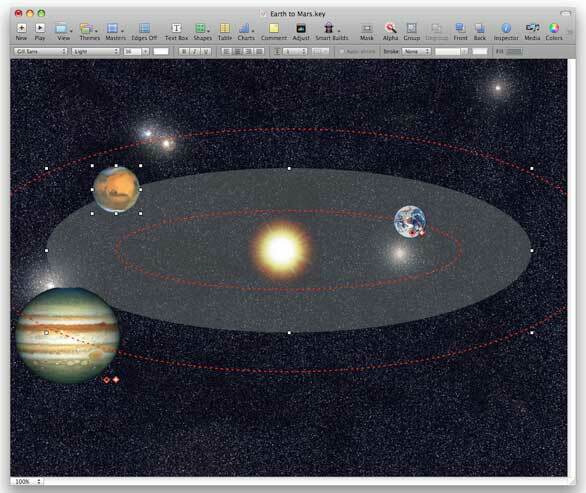 To do that, you create a slide with the planet at the center, copy the slide, and then enlarge the globe on the duplicate. Apply the Magic Move transition to the first frame, and Keynote generates a smooth zoom when you play the slide show. In addition to position and size, Magic Move lets you alter an object’s fill, stroke, shadow, reflection, opacity, or rotation, further expanding the range of possible effects. But, unlike other animations, Magic Move is implemented as a transition, so it only works with objects on consecutive slides. It would be more effective if you could also apply Magic Move to objects on one slide. Another new transition called Text Effects lets you transform one text string into another using one of four special effects, although the implementation is a bit quirky. Two of the transitions—Anagram and Swing—work only with text. If you choose either one, geometric shapes on the slide act as if you’d chosen Magic Move instead. But the two other Text Effects—Shimmer and Sparkle—apply to text as well as shapes, which is confusing. In Keynote ’08, you could display a moving object, its path, and ghosted versions of its waypoints and destination, but the path and ghosts disappeared as soon as you clicked anywhere else on the slide. Now, option-clicking the red diamond in any object with a motion path keeps the path and ghosts visible until you click the diamond again. That makes it easier to coordinate the intermediate and final positions of multiple moving objects on a slide. A clever new command in the Format menu lets you use one object as the motion path for another. When you apply the command to two selected objects, the shape in the back disappears and turns into a motion path for the object in front. That’s often much simpler than drawing a path from scratch. Another handy addition to the Format menu lets you copy animation from one object and paste it on to another. It’s easy to define a motion path for Mars based on an elliptical shape. And even though they’re not selected, the motion paths for the other planets are still visible. Keynote ’09 offers several new ways to display numerical information, including cylindrical bar graphs and mixed bar and line charts. Keynote also adds four creative builds that change a graph’s perspective as it appears on the screen. Alas, you can’t apply them to 2-D charts. Keynote’s expanded options for axis and series formatting are even more valuable for presenting numeric data. Keynote ’09 lets you display error bars as a fixed value, percentage, standard error, or standard deviation, and you can show trendlines (and the equations used to derive them) on bar, line, and scatter plots. Another new option lets you copy charts from Numbers and paste them into Keynote. Charts remain linked to their source data, so changes in Numbers are reflected in Keynote. Updating isn’t automatic, though—you have to click a button to refresh the chart in Keynote. Keynote ’09 also explicitly supports Design Science’s MathType 6 equation editor. A new command in the Insert menu inserts a placeholder onto the current slide and launches MathType if it’s not already running. From then on, double-clicking on the equation in Keynote opens MathType automatically. Extra table cell formats round out the changes to Keynote’s data display options. Duration formats numbers as units of time—you drag a slider to set the units that you want to display, from milliseconds to weeks. Numeral System, another new option, displays cell values in any number system from base 2 to 36. If the built-in formats aren’t enough, you can create custom ones that give you precise control over how data appears, including the ability to set conditions for when to apply a particular format. Some of Keynote’s new capabilities, such as the reworked Theme Chooser, aren’t groundbreaking, but simplify workflow by eliminating steps. As you move the cursor over a theme’s thumbnail, it changes to show key master slides, along with a sample table, bar graph, and pie chart, so you can gauge how your presentation will look before you choose the theme. A new drop-down menu lets you open recent files, and a slider magnifies all the theme thumbnails. Mousing over a theme reveals sample layouts like the pie chart shown in the middle row. New object relative spacing guides, which you activate in Keynote’s Rulers preferences dialog, appear when you drag an object so that it’s the same distance from two other objects. Similarly, relative sizing guides pop up when two or more aligned objects have the same height or width. Although you can distribute and align objects using existing menu commands, the guides are often quicker and easier. Another new option slims Keynote presentations by eliminating unused data from inserted media, including resized images and trimmed movies. You can apply the process to media files one-by-one or globally. As you’d expect, the savings vary. And since the reduction is one-way only—you can’t recover data once it’s gone—it’s a good idea to keep the original files handy just in case. Keynote ’09 adds eight themes, bringing the total to 44. Like the existing themes, they’re well designed, with pleasing layouts and color schemes. A new Connection Line command that’s common to all three iWork ’09 apps inserts a line between any two objects. The objects remain connected as you move them around on the slide, making it easier to create flowcharts. The Graphics Inspector sports a few additions, too, including new stroke styles and line endpoints. And there’s finally an Advanced Gradient option, complete with linear and radial fills and multiple adjustable control points for colors. Although Keynote’s Presenter Display has improved with age, it wasn’t all that it could be. For example, the slide switcher showed only three slides at a time, and there was no way to change the layout while a presentation was running. 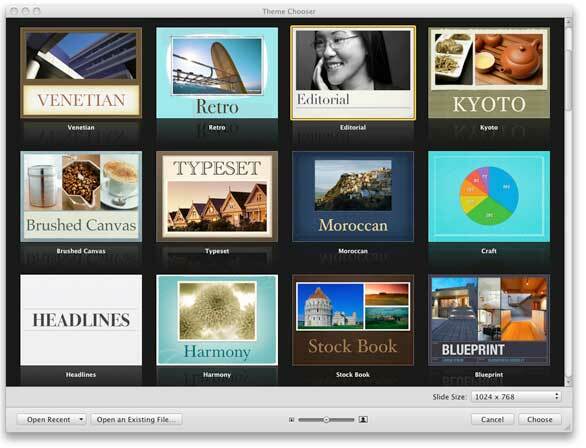 In Keynote ’09, Presenter Display gains options that remedy some of its shortcomings. The most obvious change is a toolbar with four icons—Slides, Black, Options, and Help—that appears when you mouse up to the top of the screen. Clicking the first icon displays a slide switcher that’s wider and taller than before, so the thumbnails are easier to see. (The switcher also appears when you type a slide number.) Clicking the Options icon lets you swap the primary and secondary displays, scale slides to match the display, or customize the Presenter Display layout on the go. The last icon brings up a cheat sheet that lists all the keyboard shortcuts that you can use while Presenter Display is active. Another new Presenter Display feature places blue dots under the current slide, one for each build. As the builds play, the dots get smaller and turn gray, so you know how many are left. An option to show the current slide after all the builds are done would be better still, however. It’s always been challenging to share presentations by e-mail without zipping them ahead of time. That’s because Keynote stored documents as packages, which looked like files but acted like folders. To avoid the extra step, Keynote ’09 introduces a file format that automatically compresses slide shows when you save them. But saving presentations in the new format can take much longer than before, especially if they contain large movies. Although you can set a preference that forces Keynote to use the old package format, I’d prefer if it were enabled by default. Uncharacteristically, Apple has dropped a couple of features from Keynote. Web View, which let you display Web pages on slides, is gone, and you can no longer export slide shows in Flash format. I won’t miss Flash—I can export to QuickTime and convert to Flash, if need be—but I’ll miss Web View. Old presentations with Web View slides still work, however. I was especially disappointed to see that Apple hasn’t done anything to improve the way that Keynote handles sound. For example, you still can’t play an audio file over part of a presentation, which makes it difficult to create slide shows with more than one background song. Keynote desperately needs a mechanism for syncing soundtracks with slides so that timing isn’t affected when you export to QuickTime or run a presentation on a different computer. I’d also like to see Apple devise a better interface for managing multiple stationary and moving objects, including layers whose visibility you can turn on and off and a timeline for controlling animations. For years, I’ve wanted to use Keynote to create Jeopardy-style slide shows, but that's impossible without the ability to tell if a hyperlink has been visited. I’ve also been frustrated by Keynote’s printing functions, which aren’t as intuitive as they could be. To print miniature slides that fill a page, for example, you have to use both the Keynote and Layout options in the print dialog, and there’s no way to add headers or footers to the printout. My wish list also includes a function that’s equivalent to PowerPoint 2008’s SmartArt Graphics and support for Apple’s own QuickTime VR, a deficiency that I’ve complained about before. Although it’s far from perfect, Keynote ’09 is an inspired application that gets better with time. If you create presentations for work or play and you don’t have to use PowerPoint for Microsoft Office compatibility, it’s worth the price of iWork. If you’re already using Keynote, the new version is a worthwhile upgrade.